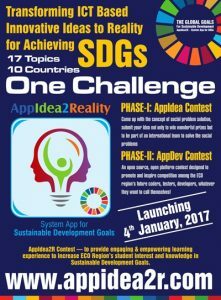 The AppIdear2R Contest provides separate opportunity for ECO region university students who can generate ideas or have app developing skills to use their ideas and technological knowledge, their ingenuity and their creativity to come up with an original System App that can be use every day. The goal of this Contest is to provide an engaging and empowering learning experience to increase student interest and knowledge in Sustainable Development Goals (SDGs). Submit your App Ideas, Develop Apps and win cash prizes and trophies.